As a general way of illustrating the effects of changes in supply or demand, or taxes thereon, on the price and quantity of goods and services, which have to be produced before they are consumed, the graphic representation is most useful. But as far as "money" is concerned, it is complete hokum, unless you accept that it is an abstraction of an abstraction. 1. Any economy is and always will be a barter economy. 2. "Money" is a useful unit of measurement, in the same way as tonness and kilograms are useful units of measurement for agriculture. You could say a farmer produces X tonnes of potatoes, or he produces £Y's worth of potatoes, and the shopper buys X kilograms or potatoes or £Y's worth of potatoes. But tonnes and kilograms are not things in themselves, they are merely units of measurement, and "money" is just a useful measure of relative value. You can't easily convert a new car to its potato equivalent, but you can easily say what a new car costs and what a pound of potatoes goes and divide one by the other. 3. To the extent that "money" actually exists, it is merely an expression of who owes whom how much "money" (i.e. future goods and services to the value of…). All banks do is a glorified bookkeeping exercise saying who owes whom how much and running the debt-collection service on behalf of the people owed money (i.e. who have produced more than they have consumed in any time period). This last bit is also a simplification - if a land goes up in value and a landowner sells, he has not, in practice, produced anything or deferred consumption, he has in fact produced nothing and brought forward his ability to consume, but there you go. 4. You can't have "savings" or a positive bank balance without somebody else having taken out a loan or mortgage first. It is actually the borrower who creates credit or prints money. But this is also hokum - if "money" were actually produced had a cost of production in itself, then there would be no such thing as debt/credit bubbles, it would choke itself off at a certain stage. For example, I'm sure most people would love to drive round in a brand new Bentley, but we don't, for obvious reasons. So the total number of Bentleys produced is a fairly low and stable figure. We can actually ignore the supply curve entirely for the time being because it is derived from the demand curve and focus on the demand curve. Why is is curved and how can we plot this? 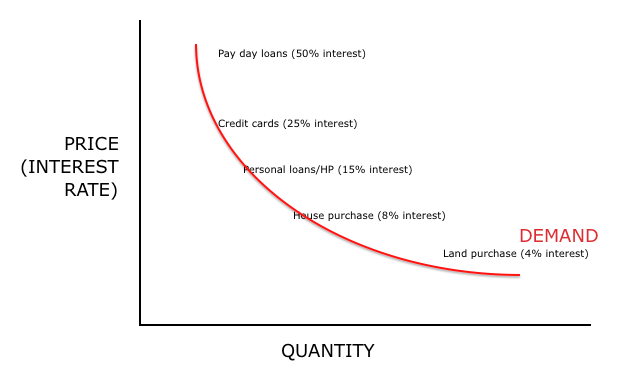 It is curved because there is no demand for "money" in itself, there is demand for what you can buy with it, i.e. consume. - for how many years you will benefit from spending money today. - credit cards have an interest rate of 25%. If you are in the shop and overcome with an urge to buy new clothes or an electronic gadget for a couple of hundred pounds NOW, you are happy to pay fifty quid interest over the next year. - if you need a van or a car for work, costing thousands of pounds but which will last you a few years, you are happy to take out a personal loan or an HP loan at 15%, because the £1,000 a year it will cost you in interest is less than the extra income you can earn for the next few years. - if you are renting an average house with a build cost of £80,000 and paying £10,000 a year rent, you are happy to take out an £80,000 mortgage at 8%, pay £6,400 a year in rent and gamble on the repair and maintenance costs being less than £3,400 a year. - if interest rates are lower than this, or if rents are higher than this, the money borrowed will be spent on land (which includes land speculation and credit bubbles, see last chart). - pay-day loans. 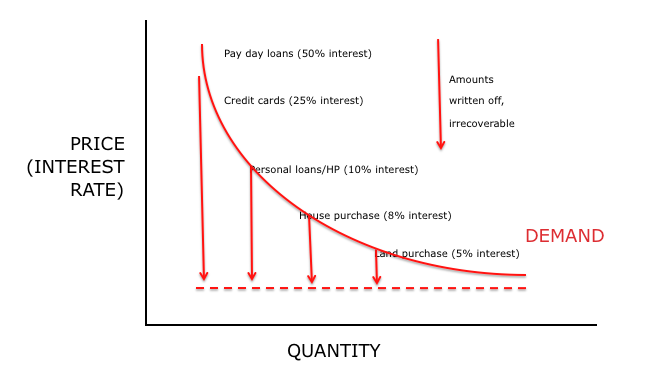 Interest rate 50% minus collection costs 15%, minus write-offs 30% = net profit 5%. - credit card loans. Interest rate 25%, minus collection costs 10%, minus write-offs 10% = net profit 5%. - personal/HP loans. Interest rate 15%, minus collection costs 5% minus write-offs 5% = net profit 5%. - house purchase loans. Interest rate 10%, minus collection costs 3% minus write offs 2% = net profit 5%. With land purchase/speculation and credit bubbles, these rules no longer hold and the real return to the lender is negative. 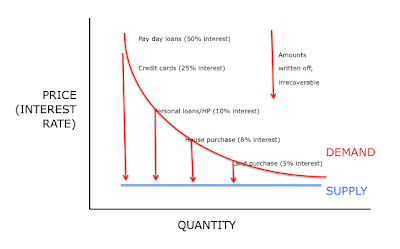 So what does the demand curve look like from the point of view of the lender, once we deduct collection costs and write-offs? Employees of such a company might be blissfully aware that this is how their wages are paid, but that is exactly how it works. The car worker gets £x thousand paid into his bank account each month. The car salesman sells the car on HP, and the bank (the HP provider) credits the car manufacturer and assume liability for collecting the debt. So the car worker/manufacturer produce a car and somebody buys the car. All the bank does is debit "HP loans" and credit "car manufacturer"; there is then another entry "debit car manufacturer" and "credit car worker" at the end of the month when the wages fall due. This is a nice simple real-world model which we can hopefully understand. And it works, in real life, there is an overall benefit to mankind and the economy from running things like this. The existence of "money" and the banking system oil the wheels and enable specialisation, spreading monthly income against daily or irregular expenditure etc. 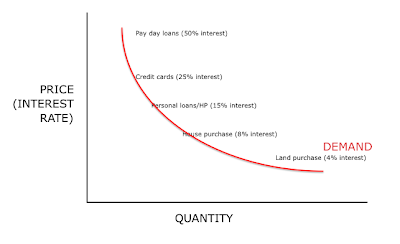 Where the model becomes a bit fragile and breaks down is once rents are high, interest rates are low, there is an expectation that land prices will rise faster than interest rates and when bankers are paid according to the value of loans they make/deposits they take (regardless of whether the bank itself will make a profit on the deal). 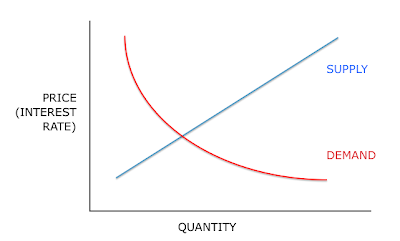 Do you have a chart with the supply/demand curve for Love? Ask your kids to figure it out. BTW Barter is a myth. It never ever existed. Not sure if you are saying it ever did. The most exchanged thing IS the money by nature. Something cannot be both goods AND money at the same time. 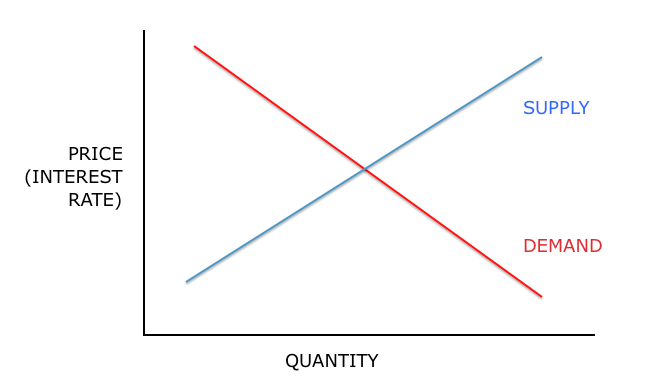 So the means of exchange, once money, is not longer as valuable as goods. And use it as goods and its you will be a very silly person. So barter never existed. Its a myth. RS, I let a man keep his pony in my field and in return he blast-cleaned my woodburning stove. Does this make me a unicorn? Bayard: even if it´s an esoteric point now, it´s something you can argue about. Here is a blogpost by anthropologist David Graeber, which claims that there is no evidence for barter preceding money/credit. In your example, there isn´t the value-for-value exchange like you have with monetary exchange, a subtle difference. You may do the transaction with a reference to money because it exists. But OTOH we do, as MW describes, have barter now, with the system of money and credit. Would have thought the supply of money is affected/effected by the Guv's economic policies and their efforts (now) to pump up property loans/house prices with low interest rates before the next election. For a more critical view of Fractional Reserve Banking see that scourge of LVT, Murray Rothbard ,and his polemic on FRB (on the Net). RS, as per usual, I have no idea what you are trying to say. B, ta for back up. "What anthropologists have in fact observed where money is not used is not a system of explicit lending and borrowing, but a very broad system of non-enumerated credits and debts." You can call it what you like, it's all barter. DBC, yes, that is illustrated in the last chart - the "common sense" model only covers about a third of all bank lending, two-thirds of it is land speculation. And as I said, I'll do that next week when I have time. Banking is like booze - up to a certain level, it is A Good Thing, beyond that it is A Bad Thing. And I'm bored with all this wailing about FRB from people who don't understand it and try and make it seem more complicated than it is. MW: yeah it´s the numerical consistency and transactions outside an "in-group" that makes money different, a question of degree. Where Graeber weers off in the end is trying to explain away most of modern economics because the premise of Adam Smith et al was not based in historical evidence. When we do have value measured in money, economics is actually somewhat predictable, if not an exact science. The claim by RS that barter “never existed” is dented by the fact that much of the trade between communist countries prior to the collapse of communism was on a barter basis. E.g. Russia sent X million barrels to oil to Czechoslovakia, and the latter sent Russia Y thousand vehicles in return. Also, barter takes place in every street in the country right now. E.g. I regularly borrow or cadge stuff off my next door neighbour and he regularly borrows / cadges stuff off me. Plus the standard husband / wife relationship involves a lot of barter. E.g. one spouse goes out to work, while the other does housekeeping chores. Mark: Your claim in the above article that ALL MONEY is created by commercial banks isn't quite right. In normal times about 95% is commercial bank created and about 5% central bank created. But at the moment, thanks to QE, the central bank share will have swollen significantly. I saw 10% quoted in a German publication. Commercial bank money nets to nothing, as you imply: i.e. for every creditor or “someone holding £Z of money”, there is someone in debt to the tune of £Z. In contrast, in the case of central bank created money (so called “monetary base”), that’s a pure asset as viewed by the private sector. You can count the central bank / government as a debtor of sorts. But it’s a slightly strange sort of debtor: the debtor has the power to confiscate (via tax) any amount of money from his creditor at any time. RM, thanks for barter examples. You say "Mark: Your claim in the above article that ALL MONEY is created by commercial banks isn't quite right." No that's not what I said. 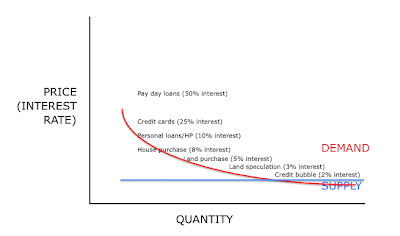 As Kj's linked article explains, there is a huge grey area between barter and payments in cash, "money" as a means of exchanging value is very useful and appears to have invented itself many times over, and not just by banks. "All banks do is a glorified bookkeeping exercise saying who owes whom how much and running the debt-collection service on behalf of the people owed money... It is actually the borrower who creates credit or prints money." We can do QE/government borrowing later on, let's just try and agree some basic observable facts before we get onto that. 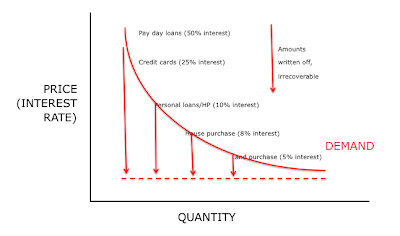 Is it a fair summary of the post that the credit system is relatively stable when used by individuals for deferred barter , but fragile when individuals act to use the dynamics of the credit system itself to generate more credit for themselves. In re barter. Know a bloke who worked for Dowty installing coal pit face machinery. Apparently the Brazilians wanted some but had no cash. So they did a deal for coffee (yes, really). I think it was a forward sale. That is the pit chocks were installed and when the coffee season arrived they sent the stuff to the UK. Don't know the rest of the story. Din, that is a very fair summary indeed :-) Question is, do people agree with or accept this? Or am I way off piste? In any event, I don't mean that we are literally a barter economy, swapping goods nad services for goods and services, we use the medium of "money" for convenience. But you can quite happily model the economy ignoring the "money" itself and just use it as a unit of measurement of flows of wealth and value of exchanges, rather than a thing itself. There's no such thing as barter, part 94. If ever someone created a intricate system whereby the whole community bartered with each other based on largely credit secured on their land, and further sent this credit around to other communities as the basis for trade... oh wait.